China View reports that July data reflects more positive changes in China's economy. BEIJING, Aug. 11 (Xinhua) -- China's key July economic data adds to the optimism that the world's third largest economy is back on the track to recovery amid the global downturn, though challenges still persist. Both investment and consumption, two major engines that drive up China's growth, increased, according to statistics the National Bureau of Statistics (NBS) released Tuesday. Urban fixed-asset investment rose 32.9 percent year on year in the first seven months. Retail sales, the main measure of consumer spending, rose 15.2 percent in July, following a 15 percent growth in June. Further signs of rebound in private spending supported a sustained growth recovery, Peng Wensheng, analyst at the Barclays Capital, said in an e-mailed statement to Xinhua. Although exports, another bedrock that fueled China's fast growth in the past few years, fell on a year-on-year basis last month, there were signs of improvement. China's foreign trade figures were better than they looked on the surface. July exports fell 23 percent from a year earlier, but increased 10.4 percent from June. Imports declined 14.9 percent year on year last month, but rose 8.7 percent month on month. According to the General Administration of Customs, the country's foreign trade has risen since March measured from month to month, and the trend of recovery had stabilized. Improvements in these data indicated China's economy was recovering and the government's policies to boost domestic demand and stabilize foreign trade had paid off, said Zhang Yansheng, a researcher with the National Development and Reform Commission (NDRC), the country's economic planner. Among other statistics released Tuesday, industrial output climbed 10.8 percent in July from a year earlier, quickening from 10.7 percent in June and 8.9 percent in May. Power generation, an important indicator measuring industrial activities, expanded 4.8 percent in July. Peng expected the country's economic growth to rise above 8 percent in the third quarter this year and 10 percent in the fourth quarter. China View reports that China's July fiscal revenue up 10.2%. �China's fiscal revenue in July rose 10.2 percent year on year to 669.59 billion yuan. �Total fiscal revenue in the first seven months of this year was 4.067 trillion yuan. �Fiscal expenditure in July rose 9.3 percent from a year earlier to 498.57 billion yuan. BEIJING, Aug. 12 (Xinhua) -- China's Ministry of Finance announced Wednesday that the country's fiscal revenue in July rose 10.2 percent year on year to 669.59 billion yuan (97.96 billion U.S. dollars). The July figure brought the total fiscal revenue in the first seven months to 4.067 trillion yuan, down 0.5 percent year on year, according to a statement from the ministry. Fiscal revenue had been on the rebound since May, which saw a 4.8 percent annual growth. In the first four months, the figure fell 9.9 percent year on year. The statement said the rebound in fiscal revenue growth was mainly because of the improvement in the country's economy, rising business taxes and increased cigarette tax. However, the figure for the first seven months declined on a year-on-year basis, which, the ministry attributed to weak business profits, tax cuts and rising export rebates amid the economic slowdown. Fiscal expenditure in July rose 9.3 percent from a year earlier to 498.57 billion yuan. The first seven months saw the fiscal expenditure climb 23.5 percent to 3.389 trillion yuan. The government unveiled a 4-trillion-yuan stimulus package in November last year to be spent over the next two years to shore up the economy, with 1.18 trillion yuan from the central budget. From January to July, 110.3 billion yuan was spent on the farming, forestry and fishing sectors, up 59.4 percent year on year, 22.2 billion yuan on environmental protection, up 55.9 percent, and 57.84 billion yuan on transportation, up 50.8 percent. Fiscal revenue includes taxes as well as administrative fees and other government income, such as fines and income from state-owned assets. China View reports that China's domestic demand rules. SHANGHAI, Aug. 12 -- China's retail sales jumped 15.2 percent last month from a year earlier to 993.7 billion yuan (US$145.5 billion), the National Bureau of Statistics said yesterday. The increase reflected a still vibrant domestic demand which supported growth in the world's third-largest economy, analysts said. "Broadly in line with our forecast, retail sales grew relatively fast in July, countering the continued decline in exports to keep the economy stable," said Li Maoyu, an analyst at Changjiang Securities Co. The growth in July's retail sales followed increases of 15 percent in June, 15.2 percent in May and 14.8 percent in April. Consumer expenditure grew 15 percent from a year earlier to 6.86 trillion yuan in the first seven months. "July's retail sales results provide further confirmation of the strength of domestic demand on the mainland," said Matt Robinson, an economist at Moody's Economy.com. "The relatively loose monetary policy, government policies to subsidize consumer goods purchases, as well as improving labor market conditions have revived household demand, which helped sustain healthy retail sales growth despite the global economic uncertainty," he said. The Chinese government has provided incentives since the end of last year to encourage people to buy vehicles and household electric appliances, including television sets, refrigerators and washing machines. The move aims at stimulating consumption when China's exports have been seriously battered by weakened external demand. Meanwhile, the average disposable income for urban residents rose 9.8 percent from a year ago to 8,856 yuan in the first half while it climbed 8.1 percent for rural dwellers to 2,733 yuan. Last month, automobile sales jumped 32 percent from a year earlier, due to government's incentives for people to buy new cars. China View reports that 74% of 414 listed Chinese companies show increased net profit in Q2. BEIJING, Aug. 11 (Xinhua) -- More than 74 percent of 414 listed Chinese companies reported increased net profits in the second quarter over the previous one, figures released Tuesday by China Securities Journal Information Data Center showed. The 414 companies are those that had publicized their half-year performances as of Tuesday. They account for more than a quarter of all stocks listed on Chinese bourses. The companies mainly involve sectors of machinery, chemical industry, electronics, medicine and real estate. The business income of the companies was up 21.51 percent in the second quarter from the previous one, while their net profit was up 76.02 percent quarter on quarter. However, compared with a year earlier, the companies' total business income in the first half year dropped 8.53 percent to 575.62 billion yuan (84.28 billion U.S. dollars), while the net profit arrived at 41.96 billion yuan (6.14 billion U.S. dollars), down 23.41 percent year on year. 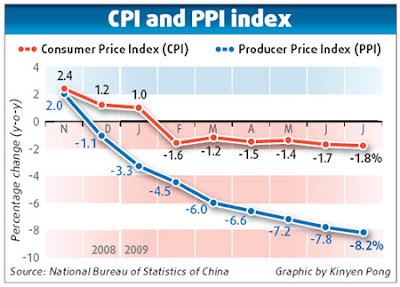 China Daily reports about China's CPI and PPI numbers. 1) Commodities were hitting their highs in July last year. Oil was over $140 a barrel. Looking at Chinese CPI and PPI numbers in this context, it is amazing that they are down so little. The consumer price index (CPI), the main gauge of inflation, fell 1.8 percent in July while the producer price index was down 8.2 percent from a year earlier, Li Xiaochao, spokesman for the National Bureau of Statistics (NBS) said yesterday at a press conference. The July figures were anticipated by the market, where investors are waiting to see more signs of a solid recovery. Food prices, which account for one-third of China's CPI, are expected to show strength in the coming months, according to Jing Ulrich, chairwoman of China Equities at JP Morgan. "Grain price inflation, in particular, has remained positive throughout the downturn," she said. A surge in pork prices, which largely led the last round of a CPI surge in 2008, recently witnessed a slight increase. Pork is a staple for many Chinese. "Pork was only about 18 yuan ($3) per kg in May and June but is now sold for 22 yuan per kg," said a housewife surnamed Cui at a Wal-Mart supermarket in Beijing. The latest statistics from the Ministry of Agriculture show that the pork price has been rising for the past seven weeks. The benchmark Shanghai Composite Index has rallied about 80 percent this year, while housing prices have returned to posting positive year-on-year gains. Policymaker s are wrestling with how to avert property and stock bubbles and bad loans. China Daily reports that China July new lending slows to 355.9b yuan. New yuan-denominated loans slowed to 355.9 billion yuan ($52.04 billion) in July, sharply down from 1.53 trillion yuan in June, China's central bank said Tuesday on its website. The broad measure of money supply, M2, which covers cash in circulation and all deposits, rose 28.42 percent year-on-year to 57.3 trillion yuan at the end of July, according to the People's Bank of China. 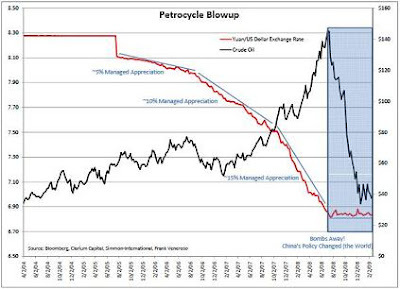 Seeking Alpha reports that how China's dollar peg keeps oil prices high. This has had the effect of flooding the Chinese banking system with capital, which has gone into new lending by banks, the stock market...and hard assets like oil, driving up growth and prices in an otherwise contracting global economy. As this was a controlled rise, with very low volatility, investors and speculators poured billions of dollars into the Yuan to gain from its appreciation. Borrow from a declining US dollar, invest in a rising Yuan, and make 10-15% of low risk money. That's called a "carry-trade". Fast forward to today. We see a rising oil price - usually a sign the economy is greatly improving - at a time when the world's largest economy, the US, is still mired in deep recession. That, Mr. and Mrs. Smith in America, is why the global oil price and your price at the pumps are going to stay high in the face of high oil inventories. Let's not even start on the huge Strategic Petroleum Reserve (SPR) China is creating. So how does this situation play out moving forward? Because a higher oil price is also problematic for the Chinese. They don't want higher oil prices to kill their economic recovery. Economic unrest has already meant riots in the street in several Chinese cities. My reaction: China's policies to boost domestic demand and stabilize foreign trade have paid off. 1) China's key July economic data adds to the optimism that the world's third largest economy is back on the track to recovery. B) Retail sales, the main measure of consumer spending, rose 15.2 percent in July, following a 15 percent growth in June. 3) industrial output climbed 10.8 percent in July from a year earlier, quickening from 10.7 percent in June and 8.9 percent in May. 4) Power generation, an important indicator measuring industrial activities, expanded 4.8 percent in July. 6) Housing prices have returned to posting positive year-on-year gains. A) Average disposable income for urban residents rose 9.8 percent to 8,856 yuan. B) Average disposable income for rural dwellers rose 8.1 percent to 2,733 yuan. 1) China's foreign trade figures were better than they looked on the surface. 2) July exports fell 23 percent from a year earlier, but increased 10.4 percent from June. 3) Imports declined 14.9 percent year on year last month, but rose 8.7 percent month on month. 4) The country's foreign trade has risen since March measured from month to month, and the trend of recovery had stabilized. B) The growth in July's retail sales followed increases of 15 percent in June, 15.2 percent in May and 14.8 percent in April. C) Consumer expenditure grew 15 percent from a year earlier to 6.86 trillion yuan in the first seven months. 2) July automobile sales jumped 32 percent from a year earlier, due to government's incentives for people to buy new cars. 3) Spending on meat, poultry and eggs rose 6.6 percent. 4) Consumption of edible oil climbed 11.9 percent. 1) China's fiscal revenue in July rose 10.2 percent year on year to 669.59 billion yuan (US$97.96 billion). 2) The July figure brought the total fiscal revenue in the first seven months to 4.067 trillion yuan, down 0.5 percent year on year. 3) Fiscal expenditure in July rose 9.3 percent from a year earlier to 498.57 billion yuan. The first seven months saw the fiscal expenditure climb 23.5 percent to 3.389 trillion yuan. A) 110.3 billion yuan was spent on the farming, forestry and fishing sectors, up 59.4 percent year on year. B) 22.2 billion yuan was spent on environmental protection, up 55.9 percent. C) 57.84 billion yuan was spent on transportation, up 50.8 percent. B) Net profit was up 76.02 percent quarter on quarter. A) Total business income dropped 8.53 percent to 575.62 billion yuan (US$84.28 billion). B) Net profit was down 23.41 percent at 41.96 billion yuan (US$6.14 billion). A) Commodities were hitting their highs in July last year, with oil over $140 a barrel. B) Although China's year-on-year CPI/PPI declined, month-on-month price changes are positive. 3) Food prices, which account for one-third of China's CPI, are expected to show strength in the coming months. 4) Grain price inflation has remained positive throughout the downturn. 5) Pork prices, which largely led the last round of a CPI surge in 2008, have been rising for the past seven weeks. 1) New yuan-denominated loans were to 355.9 billion yuan (US$52.04 billion) in July, bringing new loans in the first seven months to 7.73 trillion yuan, far exceedin g the annual target of 5 trillion yuan. 3) The narrow measure of money supply, M1 (cash in circulation plus corporate current deposits), was up 26.37 percent to 19.59 trillion yuan. 4) The government reiterated its stance of maintaining the moderately loose monetary policy despite the explosive growth of China's money supply. 1) Commodity prices are rising despite the worsening US recession because of strong Chinese demand, fueled by the billions of new Yuan printed to maintain the dollar peg. 2) In July 2008, the Chinese government made an un-announced policy decision to re-peg the Yuan to the dollar. 3) In order to maintain that peg, which means forcing the Yuan down, China must print Yuan to buy US dollars. 4) A couple of their debt auctions have failed recently, greatly increasing the monetary base in China. 5) The capital which is flooding the Chinese banking system is going into the stock market, the real estate market, and hard assets (commodities). 6) Without a peg, the Yuan would naturally rise against the US dollar, attracting capital as one of the few growing economies in the world (as it did between 2005 and July 2008). 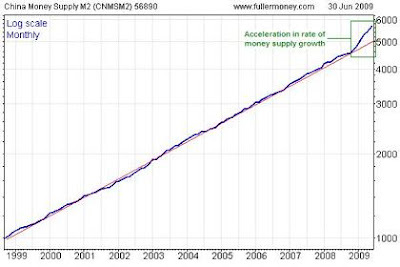 1) China's money supply has exploded since China re-pegged, which is helping drive up commodity prices in China. 2) Higher commodity prices are problematic for the Chinese, who don't want higher oil and food prices to kill their economic recovery. 3) Economic unrest has already meant riots in the street in several Chinese cities. A) China keeps dollar pegs, but, instead of buying US treasuries, China uses foreign exchange reserve to buy commodities, increasing China's domestic supply and keeping prices down. This means subsidize the domestic commodity prices, keeping demand high. B) China breaks the peg, which would cause the Yuan to rise quickly, making oil cheaper in Yuan. Conclusion: The end result of China's economic recovery is clear: higher commodity prices for the rest of the world. As I wrote in January, hyperinflation will begin in China and destroy the dollar. The graphics below should make clear why commodity prices are rising. The increasing supply of Yuan means that a lot more money is chasing China's domestic supply of commodities. As a result, the prices of commodities in China is higher than the rest of the world, and this price imbalance is leading to record commodity imports (Chinese producers are buying commodities abroad rather than pay higher domestic prices). 1) The 32 percent jump in automobile sales explains China's surging oil imports. 2) The 11.9 percent increase in China's consumption of edible oil justifies the high level of soybean imports. The title has a spelling error -- Strenght -> Strength. Anonimous - Well the rest of us think you are weird and obsessed so just go away. Eric do keep deleting him he is a bore and waste of space. Anon Coward, i dare to suggest you.. please use to fill your identity so anyone like me -- who is already annoyed with your comments -- can choose to skip them from the first line. It could be very helpful. I read your post before Eric deleted it. Personally, I do not understand why he deleted it, but I do not understand your question neither. I am not English native speaker, but you are talked about "commodity bubble" in China. You stated it as "great commodity bubble" as I remember. Perhaps, I do not understand what Eric talked about, but your question looks quite unnecessary. 1. "The increasing supply of Yuan", as I understand, coming from dollar peg China government have to US dollar. SO WITH or WITHOUT stimulus package - the amount of paper Yuan in China WILL increase since China government IS forced to keep peg to US$. Of course they can print as much Yuan they will, but this increased amount of paper will NOT cause great INFLATION until the DEMAND in China (or abroad for Yuan) increase! Or on the other way the CBC would be able to mop up huge amount of Yuan FROM the market. 2. Since Chine EXPORT sector was suffering for awhile - the government implemented ADDITIONAL a stimulus package with TARGET to develop domestic DEMAND. Obviously, they succeeded on it. A) Subsidized "the people" for the commodity prises (oil for example) - in order to avoid unrests since with YUAN PEG on US$ - Yuan is unnaturally "low" and logically - if you bought a car you need the gasoline too. Apparently "the people" bought many cars those months. B) REMOVE the peg on US$. In this case YUAN will automatically get much STRONGER position in relation to US$ and again commodities in China (gasoline for example) WILL be cheaper for average Chinese. IN BOTH cases the "flooded Yuan into the economy" - fades away. - "the people" will NOT NEED to give a huge bunch of paper yuan for same amount of gasoline (for example) - which GIVE the government an opportunity to "mop up" excessive YUANs FROM the market. So personally, I think that your question is already answered in text, but of course perhaps I did not understand your point. If they keep the peg, the USD printing and associated Yuan printing will continue to drive up the price of oil anyway in both USD and Yuan. You guys exposed a fatal mistake in my reasoning. The pieces clicked when I realized I was looking at this from the Yuan perspective only and not willing to look at the what would happen to commodity prices for the dollar. But thank you Natasa and Robert for your willingness to correct my error, and to do so in a non-judgmental way. Both of your responses prove that an open community, and a community that is willing to help each other on their path to seek the truth does indeed matter... for the truth shall, in such a community, will always shine. Shouldn't this go under currency collapse? If prices are up 20%, sales going up 15% is not so impressive. Not that what they are doing is wrong, but your optimism regarding China is still questionable. If the US economy imploded, and the dollar became worthless, where would China stand? By weakening the Reserve Currency of the World to pay for US deficit spending wouldn't that push up the price of commodities. Isn't 70 percent of the world commodities tied to the US Dollar. What caused the Asian boom and crisis of the 1990. When Yen and/or US Dollar "Carry Trade" is generated through Austrian and New Zealand Dollar, how much of that liquidity will be recycled to Asian counties like Singapore, Thailand, Taiwan, China, and etc. If China is absorbing the liquidity generated through part of the speculated profits from Carry Trade, then can the explain quick reversal of the Chinese economy. Can a decline in GDP in New Zealand and Austral cause unemployment rate to raise, if so will New Zealand and Australian Federal Reserve be forced to lower interest rate. What will lower New Zealand and Australian interest rate do to Carry Trade. If Carry Trade unwinds again like it did in July and November of 2008, what will that do to China. 1) I suspect Anonymous is perhaps not a legitimate reader (why does he hang around a blog he disagrees completely with?). It cost very little to hire someone to go around posting comments on blogs and message boards to try to discredit opponents. In is PR tactic used by big firms and other institutions. For example, Have a look at this interesting lecture on (naked) short selling. It offers the evidence about the abuse of social media by the DTCC (the institution which enables most naked short selling). The attempts to manipulate Wikipedia are particularly interesting. 2) Consisder this, during the last few weeks, over half the time the first comment on my entries has been disagreeing view. Since most of the visitors of this blog are here because they like what I write, it is unatural for the first comment to be negative so often. 3) I have grown very tired of repeated negative comments by readers who obviously haven't read many of my articles. If someone disagrees with most of what I write, then they should go read the blog of someone who agrees with them, like Mish (he believes in deflation and the strong dollar). Nasty comments make life unpleasant for other readers. 4) While I could easily answer all these comments, it would take 10 to 15 minutes for each responce and I don't have that much time to waste. Deleting comments takes me 3 secs. "To deliberately to deny people a voice is to deny the ability for to arrive to truth, even me." Oh, and don't even bring free speech into this. Anonymous, you are completely free to start your own blog and post your nonsensical arguments there. Market Skeptics isn't a forum, it is a blog where I presents my views. It is arrogant of you to think you have a natural right to present your disagreing views on my personnal webspace. From now on, I will agressively delete tiresome comments by anonymous, because me and many of my readers are fed up by them. "Forever to be known as the great Chinese commodities bubble!" Calling rising commodity prices "a bubble" is misleading. bubbles are caused by excessive speculation, and, when they burst, prices usually fall back down to where they were before the bubble started. Commodity prices are moving higher today because of physical shortages and monetary inflation. Both of these factors are more or less permanent and irreversable. There is virtually no chance of commodity prices falling back down to the lows seen ealier this year, which is why calling rising prices a "commodities bubble" which could "burst" is misleading.